I could eat a runny-yoke egg- be it poached, soft boiled, or over easy- on top of any meal (I'm pretty sure that's not an exaggeration). If you can get whole seeds and grind them fresh yourself when you make this recipe, the resulting flavor will be greatly enhanced. However, pre-ground spices will work just fine. If you're looking to simplify this recipe further, you can use a premixed garam masala blend instead of the cumin, coriander, cardamom, pepper, cinnamon, cayenne, turmeric and nutmeg. Add all vegetables and garlic to a lightly greased saute pan and cook over medium heat, stirring frequently. Add all spices and continue to cook until vegetables begin to shrink, wilt and become aromatic. Add lime juice and seafood and cover pan. Cook for 2 or 3 minutes covered or until scallops and squid rings are opaque white and shrimp is pink and firm. Meanwhile, bring water to a light boil. Add vinegar. Crack egg into a small bowl. Gently slide egg into vinegar water. Allow to poach for three minutes or until yoke begins to cook but is still runny and egg white is opaque. Remove from water with a slotted spoon. 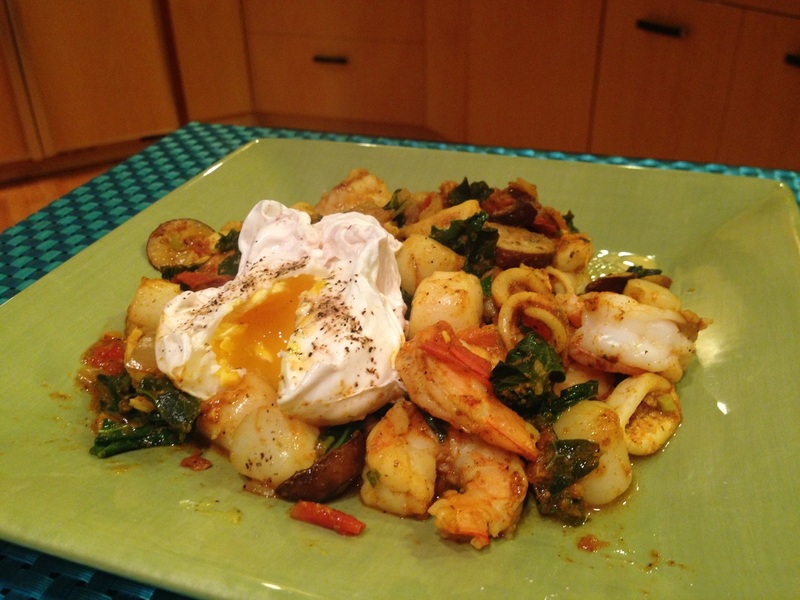 Serve egg on top of seafood masala with a sprinkle of pepper.